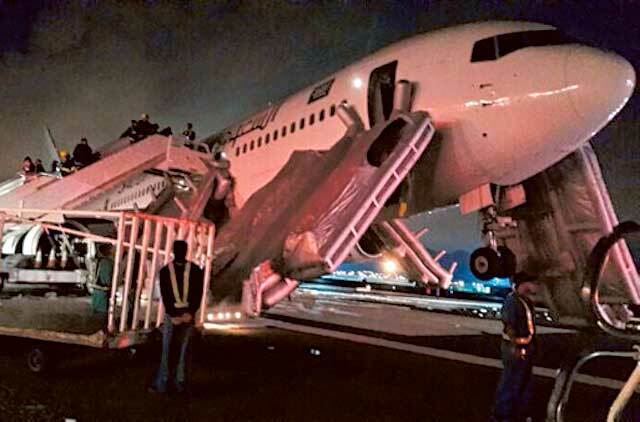 Jeddah, Saudi Arabia: A Saudi Arabian Airlines jet made an emergency landing in Muslim holy city Medina in the west of the kingdom on Sunday, injuring 29 people, an aviation authority spokesman said. The Saudia aircraft was travelling from the Iranian city of Mashhad with 315 passengers on board, General Authority of Civil Aviation spokesman Khalid Al Khaybari told AFP. Of the 29 people injured, 11 were taken to hospital, while the rest were treated at the airport’s medical centre, he said. Khaybari did not elaborate on the type of aircraft or the cause of the emergency landing. Footage posted online showed a plane landing apparently without its rear landing gear down and leaving a trail of flame along the runway.